One-of-a-kind, made by hand, signed by the artist, and meaningful, this is a gift newlyweds will cherish. 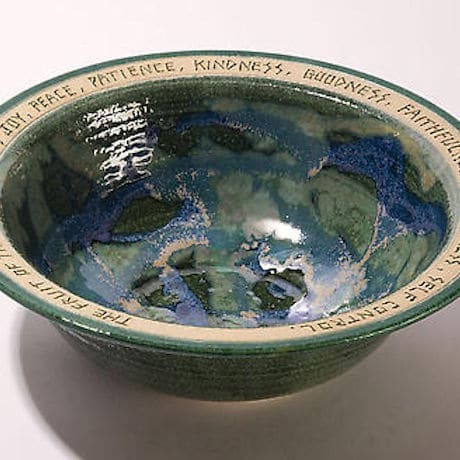 Hand-thrown on the wheel by Wisconsin potter Bryan Becker, stoneware bowl is inscribed on the rim with words from Paul's letter to the Galatians: "The fruit of the spirit is love, joy, peace, patience, kindness, goodness, faithfulness, gentleness, and self-control." Dishwasher, microwave, oven, and food safe. 10" diameter, 3 3/4" high. EXCLUSIVE. 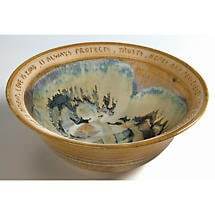 Inscribed on the rim with words from Paul's letter to the Galatians: "This fruit of the spirit is love, joy, peace, patience, kindness, goodness, faithfulness, gentleness, and self-control."